2013/01/10: Technicals and Might US Equities Attempt a Jailbreak? 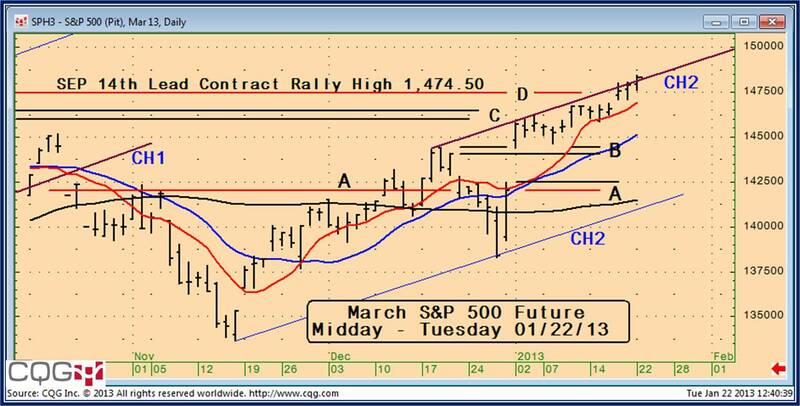 A fresh set of Technical Projections and Select Comments are already available via the link in the right hand column, current through Wednesday’s US Close. And yet, we may need to update those again very soon due to the influence of some upbeat corporate guidance (a real change from last quarter) and the ‘lack of crisis’ guidance from President Draghi at today’s ECB press conference. The old saying on why the press is so fixated on sensationalist content is that you can’t sell papers with the headline “The House Is NOT Burning.” Maybe not. But you can sell equity investors the idea of a lack of a crisis is grounds for expecting better earnings, or alternatively earnings multiple expansion enhancing the price of equities. The latter has been one of the main arguments of the bulls for some time. They have asserted that crisis fears have multiples unreasonably low. And even with our reservations about the way forward after this month’s positive influences, that does make a difference. With S&P 500 companies estimated to earn approximately $100/share (subject to revision), each one point change in the P/E multiple is a difference of $100 in the index… no small matter. And those better sentiments on Europe and the reversal into somewhat improved corporate guidance mean an improvement in the P/E multiple to 15 might be reasonable; at least unless and until those 2013 headwinds begin to bite. 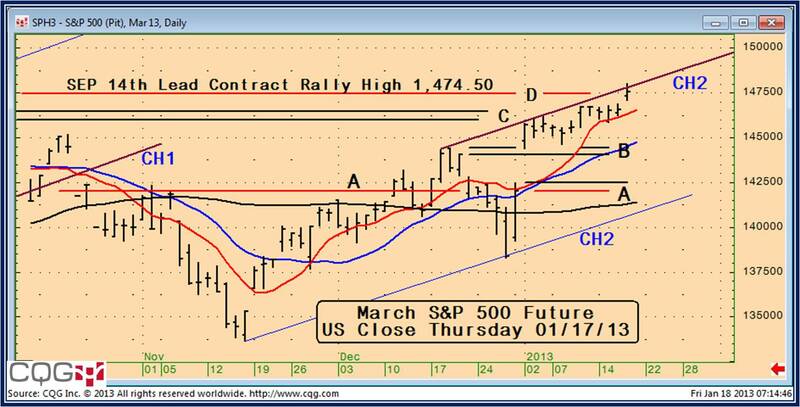 See our Tuesday Cal-Perspective and US December strength to continue? post for much more on what still might go wrong into next month. Yet as we explicitly noted there, this is only going to become a factor later this month into February. In the meantime, the question is whether the S&P 500 future might be ready to reflect some folk’s full annual 2013 target right away early in the year? 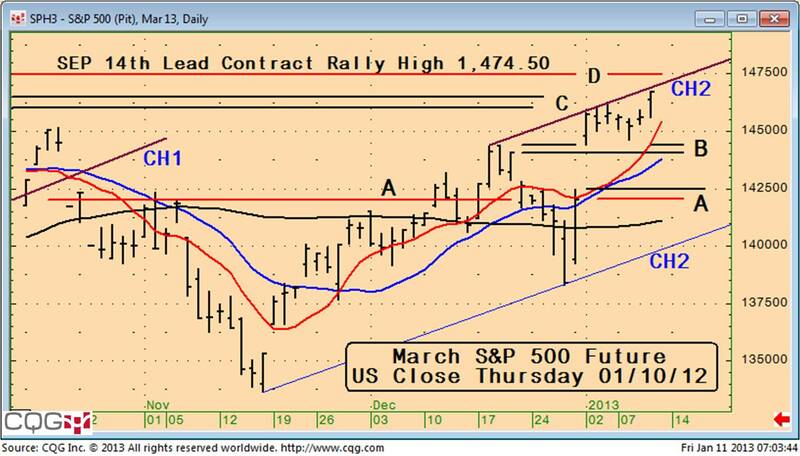 Well, when some sort of aggressive expectation such as that rears its ugly (or beautiful depending on your trend opinion) head, it is best to ask what the market is telling us about the ability to advance straight to the implied target in the low 1,500 area. And in that regard, the current technical projections are quite enlightening. While there are other factors we will be adding (in the market comments below) to the confluence of factors that make the current price area critical, one or two things are the obvious from the simple chart picture.